Welcome to winter! 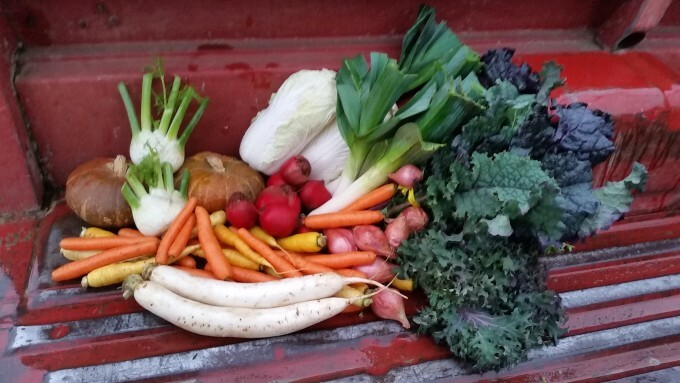 We are excited to kick off the second year of our winter CSA. We have found that our growing systems, soils, and infrastructure enable us to grow really fantastic fall and winter crops. We have also trialed lots of varieties and have selected our very favorites over the years- crops with great flavors, colors, textures, and storage abilities. Our goal is to provide you with a share that has as much variety as possible during the winter season; earthy roots, fresh crunchy radishes, aromatic herbs and alliums, rich winter squash, sweet leafy greens, and juicy cabbages…you get the idea! Look forward to lots of great staples like beets, carrots, and squash, along with slightly lesser-known crops like chicories, kohlrabi, or celery root. Putting together the CSA share is almost like curating an art exhibit and we love it! Happy eating! Each week we will provide some tips on how to best preserve the freshness and quality of your produce. Onions, shallots, and squash can stay out on the counter, or live in the pantry or garage. Just monitor them to check for mushy spots that might start to develop. Just about everything else would love a spot in your fridge inside a plastic bag (those are like antiques in Portland by now, right?). If you don’t have space in the fridge for everything, there are various cellaring options that we’ll go into throughout the winter. A bucket or tote with sawdust is a popular way to keep roots firm and moist for a long time (I’ve personally kept roots good this way until APRIL). The real keys here are cool temperatures combined with humidity retention. The ideal conditions are very near freezing and 90-100% humidity; which may or may not be attainable for your personal circumstances, but its a goal to aim for and keep in mind. Whatever you do, never ever ever place root crops, greens, or cabbages in the fridge, on the stoop, in the garage, or anywhere else without somehow wrapping or sealing them to keep the moisture in. Totes, tubs, plastic bags, buckets or the like will keep the moisture content from evaporating. Another tip is to keep a bag or tub in the freezer for all your veggie scraps and trimming. Leek tops…onion skins…carrot tips…cabbage ends…meat bones…toss it all into the bag in the freezer and when you’ve reached critical mass you can simmer it into some fantastic stock. The only exception is to not load up on too many brassica crops (kale, cabbage, kohlrabi, radish) because it’ll give the broth a bitter flavor that overpowers a lot of the other ingredients. If you’ve included meat scraps or bones, add a splash of apple cider or white wine vinegar to draw all the nutritious marrow into the broth. Beets, Chioggia: These are a festive heirloom from Italy. The pink and white stripes are stunning but alas do not stick around very well through the cooking process. Nonetheless, these beets are a tried and true favorite that always has a spot in our beet plantings. Cabbage, Napa: We are really proud of how this Napa cabbage came out. We normally grow it in the spring, and this was a inaugural foray into late-season possibilities. We will admit, we were not expecting great things as excessive warm weather and pests took their toll. After proceeding to ignore the Napa for a while, we noticed it had bounced back and actually tasted great! Napa is great for creating kimchi (along with Daikon and carrots), can be shredded and used raw in salads or slaws, or cooked lightly. Some of the heads have ‘pepper spot’ which is a harmless condition that appears as if the cabbage leaves have little flecks of pepper on them. Its a cosmetic attribute that doesn’t affect its taste or edibility, so you don’t need to worry about trimming it off. Carrot Mix: This is a blend of a super juicy and sweet orange carrot along with a French yellow cooking carrot known and Jaune De Doubbs. You can use them all together or select each for different applications. The yellow carrots hold up very well to cooking and turn a rich golden yellow. So if you hate the baby food effect of sometimes overcooking the carrots in soups or stews, give the yellow carrots a try- they really shine in hearty roasted or stewed dishes. Kale: We put in a bunch of Red Russian and a bunch of Rainbow Lacinato. Both are selected and refined by the fabulous Wild Garden Seed company. These are bred to thrive in our climate and that they do! We are glad to have lots of hearty winter greens like kale for the CSA…they are so good for you in the winter (or anytime) and go great with just about everything. Radish, Daikon: These extra jumbo snowy white roots also come to us by way of Japan. I like making a refreshing slaw with an Asian twist by shredding radish and Napa cabbage together and dressing with sesame oil, tamari, rice vinegar, and a hearty dose of minced ginger, garlic, and chili flakes. Even though its a cold dish, on a gray drizzly day this will get your tastebuds and your circulation hopping! There may be an occasional dark spot along the length of the root- which is evidence of a pest known as ‘rust fly’. It’d be a cryin’ shame for us to discard the whole fabulous root over a little blemish…so if you find that, either give it a quick peel or cut that spot out. These will store for a very long time in the fridge in a plastic bag, so don’t worry about having to eat it all at once. Winter Squash, Kabocha: This is a really wonderful winter squash that comes to us from Japan. It ripens quite quickly in the late summer/early fall and is always the first to be harvested. It has a dry, flaky texture and an amazing nutty flavor. This is definitely a farm favorite! A classic way to prepare it is to cut it in half, scrape out the innards, and slice the whole thing (rinds and all) into fairly thin slices and roast in the oven. This method really highlights the texture and flavor of this variety.